Oh the fun of Twitter! Oh the fun of April Fools’ Day! Inspired by a hashtag, and the annoyance of successive newcomers to Highland Park trying to be cool by abbreviating our name to “HP,” (Anyone who’s lived here long enough, knows we abbreviate it as “HLP.”) this blogger headed south via the Metro 251 Bus from Figueroa and Avenue 26 to the heart of the real HP: Huntington Park to fool around on April Fool’s Day. The entire day was spent tweeting as HP90255 instead of the usual HLP90042. It was fun. It was funny. 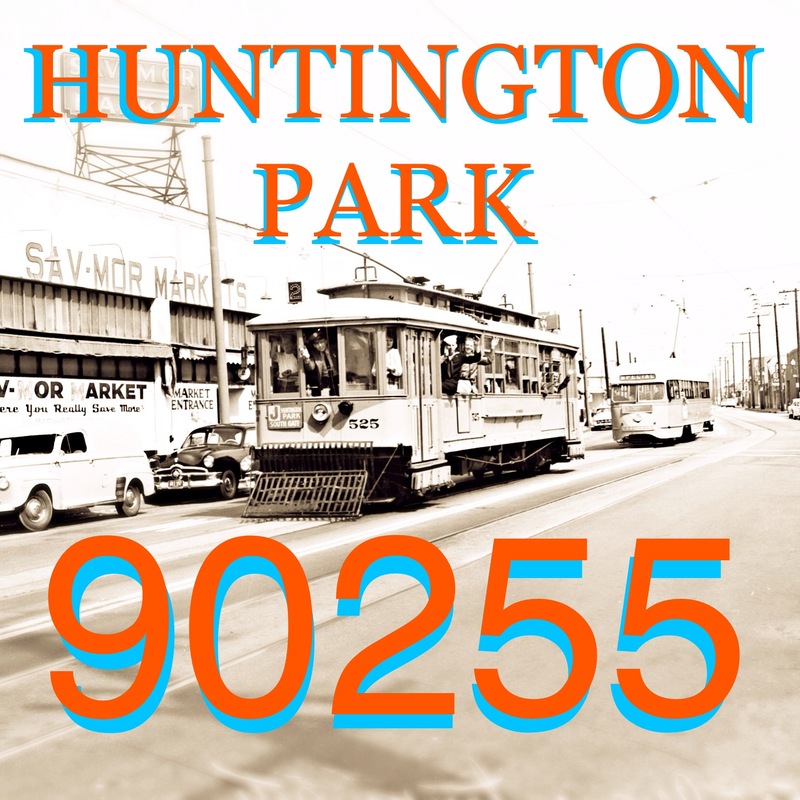 But also an opportunity to compare and contrast our Highland Park with their Huntington Park. The two things that are most striking about Huntington Park, compared to Highland Park is how flat the place is. That is, there are no hills! A type of terrain completely foreign to Highland Parkers. The other big difference is how surprisingly clean and well-maintained this city is. Even though Huntington Park is imbedded within an industrial area, it is by-and-large a well-kept town, lacking litter and the something-dumped-on-every-block mentality that plagues Highland Park. Also, where’s the graffiti? Sure, it exists, but unlike Highland Park where you can’t look at a pole, sign, broken sidewalk, garage, wall, street, curb, dumpster, abandoned couch, utility box, fence, tree, window, door, or mural without seeing someone’s name tagged on it, Huntington Park is practically blank. (True story: Saw a teenager in the park pick up a pen from the floor, walk over to a trash can, and instead of writing on it, he threw it away!) The city parks are all green and free of gophers. The playgrounds are un-vandalized. There are rose gardens all over the place. There aren’t shopping cart armies roaming the streets scavenging the trash cans, or stray dogs in the streets. Huntington Park is CLEAN. Sure there were other differences, such as HP lacking the artistic influence that Highland Park has; didn’t see any murals, art galleries or art spaces. Historic Preservation is not much of a driving force as it is here in Highland Park. There are no bike lanes or bike routes, and the city has only one sidewalk-installed bike rack (recently placed at their first parklet on Pacific Blvd). Aside from being under the LAX flight path, there is a quietness to HP that escapes Highland Park with the sound of the frequent LAFD and LAPD sirens combined with airship manhunts that lock-down neighborhoods for hours on end. Also, Huntington Park is devoid of house flippers. Unlike Highland Park, the city is completely free of horizontal slat fences. Quality-of-life wise, Huntington Parkers have it made. HP shows us that smaller is better and more effective. No, HP is probably not going to be mentioned in Condé Nast any time soon, but they should be proud, theirs is a fine working-class city without many of the problems that grip comparable City of Los Angeles’ neighborhoods such as our HLP. Welcome to the City of Huntington Park. Under the LAX landing path. A classic Eldon Davis’ Googie Norm’s. Line out the door all morning. Eldon Davis details on the Huntington Park Norm’s. No Norm’s, remodeling isn’t what makes you special. When you cross the Huntington Park border, you get all these business cards. Lots of rules. Especially for truckers. Classic buildings stuccoed over, just like in Highland Park. HP Auto Parts. Wonder what the HP stands for? More shops than a shopping center. Rediscover Huntington Park, downtown. Then move along! In line to pay the gas bill. 60 Bus, the main line between downtown Los Angeles, and downtown Huntington Park. Rancho San Antonio Home Savings & Loan mosaic by Millard Sheets and Susan Hertel. Pacific Blvd. Named for the Pacific Electric trolley that traveled here. 1930 Warner’s Theatre, by B. Marcus Priteca. The Eastern Building, an Art Deco monolith. No bike lanes in Huntington Park means lots and lots of sidewalk riders. Huntington Park has MORE Salvadorian restaurants than Highland Park. The City of Huntington Park has its own bus shelters. Their Tam’s looks like a palace compared to ours. Huntington Park is completely flat. Thus, the water tower, that is also a cellphone tower. Playing cards in the park. Huntington Park Justice Building. Built, 1950. The Great Seal of Huntington Park. Huntington Park Library. An LA County Library branch, it opened in 1970 as San Antonio Regional Library. Huntington Park East / West bus lines. Like HLP, HP has competing 76 and Shell stations. American Indian Recourse Center at the Huntington Park Library. A brochure for namesake, Henry E Huntington’s library at the Huntington Park Library. The Huntington Park News Board. Highland Park has the Los Angeles Police Museum, Huntington Park has the International Police Museum. Unlike HLP, HP is a strangely more peaceful place, lacking in the constant cacophony of sirens and police airships. Animal control in Huntington Park is handled by the police. The HP version of LA City Council District 1’s “Keep It Clean” campaign, but effective. The 1989 sister city fountain from Yahualica, Jalisco Mexico. Fenced-off for some reason. Almost got kicked out of their city for ringing their Centennial Bell. Looks like Leimert Park here. If this were HLP instead of HP, there would be horizontal fences here. HLP has rooftop lions, HP has an elephant. The Huntington Park Soccer Circle, and Circus Circle. Playground at Salt Lake Park. Salt Lake Park, Huntington Park. Salt Lake Rail Road that once went through Highland Park and across the York Blvd bridge. Rose gardens. Huntington Park has lots of rose gardens. 1973 Rose Garden for Richard Collins, pilot lost over Laos during a bombing run in 1969. St Matthias Roman Catholic Church, built 1950. HLP’s St Ignatius needs a statue like HP’s St Matthias. One of those classic coin-operated parking meters we used in HLP back in 2008. Homeboys! Just like we have back in Highland Park. This place looks like fun. Huntington Park is the XV Años capital of the U.S.
HP’s Kress Building is bigger than HLP’s. But thankfully, ours hasn’t suffered this horrible remodel. The only concentration of tagging found in Huntington Park. HP’s and HLP’s masonic temples were built the same year. Highland Park has the Highland Park has Highland Theatres with 3 screens showing first run films for $4-7. Huntington Park has the Park Twin Theatre with two screens showing first run films for $5 anytime. Highland Park has gelato and shaved ice, Huntington Park has froyo. Sorry Highland Park, GAME OVER. Found the correct location for this “HP Happening” sticker. No, Thank You Huntington Park! Download the Official App for Highland Park! !